May 2012: a glimpse into our courtyard garden! Though just a small courtyard with a space measuring 13 by 8 feet, this lovely rectangular void serves us very well indeed! Luxuriant foliage plants to greet us endlessly throughout the day and a private place to do some exercises to keep us healthy. Besides, it brightens our indoors with sunlight penetrating through the sliding glass doors and windows and refreshes air within our home. We just love this open space. Even though the number of plants have been greatly reduced deliberately due to health reasons, as compared previously, whatever is being displayed currently is sufficient to delight and keep us extremely happy and contented! Sharing pictures below to give you a glimpse into our courtyard garden. Enjoy! An overall view of our courtyard (indoor) garden which is adjacent to our dining hall. Mostly showcasing tropical foliage plants. 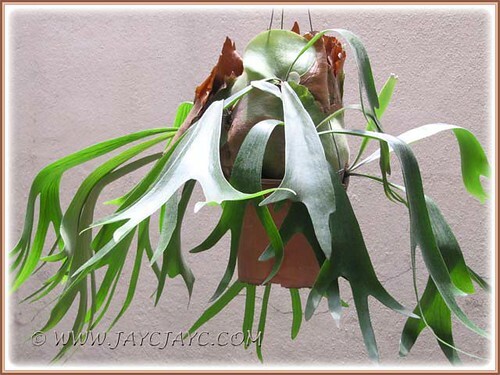 We’re extremely delighted at how gorgeous this hanging pot of Platycerium bifurcatum (Staghorn Fern) appears now. The pups have matured remarkably well to create a lovely cascading fountain-like effect. 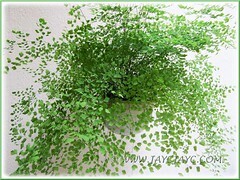 Adiantum capillus-veneris (Southern Maiden Fern, Venus Hairfern) looking luscious and elegant, just loves the cool and bright courtyard environment. 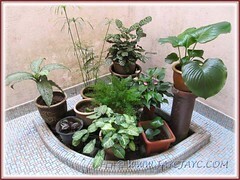 Tropical plants – Syngonium podophyllum, Proiphys amboinensis, Anthurium andraeanum, Asparagus densiflorus ‘Meyers’, Calathea makoyana, Dieffenbachia bowmannii Carriere, Cyperus involucratus. 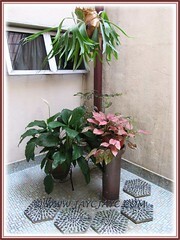 Platycerium bifurcatum, Spathiphyllum, Aglaonema cv. ‘Valentine’, Dracaena surculosa ‘Florida Beauty’. 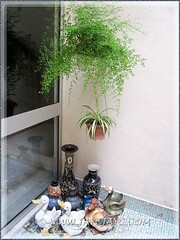 Adiantum capillus-veneris (Southern Maiden Fern, Venus Hairfern) and Chlorophytum comosum (Spider Plant). you seem to have the perfect mix that showcases every plant to perfection. What a nice clean look you have in there. The Staghorn Fern look very elegant. Ah, that is the wonderful thing about plants, it only takes a tiny new leaf in the smallest of spaces to make us smile and let us know that life will go on. 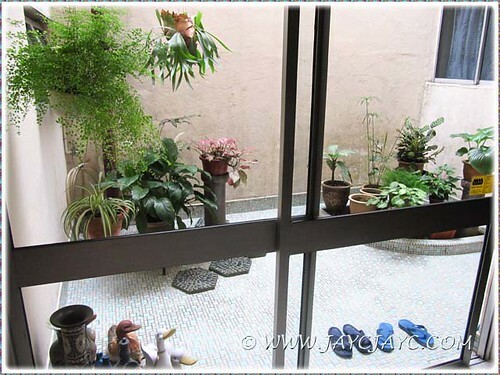 It is fun to have a courtyard garden like yours. I wish I have one too. You have kept this area very tidy. I like your staghorn fern. Can’t agree with you more, A.Belle! We’re delighted that we have retained this open area as originally designed. Thanks for dropping by and leaving your kind comments.